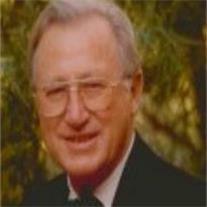 Harold Evans, age 82, passed away at home in Mesa on February 14, 2013. Born in Quincy, Illinois on April 10, 1930, Harold was predeceased by his parents, Harry and Fannie Elizabeth Evans, a sister, Dorothy Shriver, and a brother, Eugene Evans. Surviving are sisters, Lucille Tallcott, Lois Williams, Dolores (Bill) Duncan, and Nancy (Bill) Gillenwater, and brother Bill (Ruth) Evans. Harold is survived by his wife of 46 years, Pat, and three adult children: Rob Evans of Phoenix, Marcie (Irv) Schulman of Rye Brook, NY, and Will Evans of El Sobrante CA. Surviving also are granddaughter, Lia, and grandson, Patrick. An extended family and many friends will miss him. Harold attended school in Mendon, IL, served in the Army, attended University of Illinois, and then moved to Arizona some fifty years ago. After retiring from Valley National Bank, he continued to work in agriculture until the last two years. He was always ready to drive through the fields and desert of Arizona. Arrangements are entrusted to Bunker University Chapel, Mesa, 3529 E University Drive. The family hopes that contributions to a favorite charity of one’s choice or to Mendon Congregation U.C.C., 106 E. High Street, Mendon, IL 62351, will be considered in lieu of flowers. Following the services, the family would like to host everyone for lunch nearby at: Rancho de Tia Rosa, 3129 E. McKellips Rd., Mesa, AZ. After lunch, the family will welcome visitors for coffee and pastries at their home.